Do Hedge Funds Love Reliance Steel & Aluminum Co. (NYSE:RS)? Hedge funds and large money managers usually invest with a focus on the long-term horizon and, therefore, short-lived dips on the charts, usually don’t make them change their opinion towards a company. This time it may be different. During the first 6 weeks of the fourth quarter we observed increased volatility and small-cap stocks underperformed the market. Hedge fund investor letters indicated that they are cutting their overall exposure, closing out some position and doubling down on others. Let’s take a look at the hedge fund sentiment towards Reliance Steel & Aluminum (NYSE:RS) to find out whether it was one of their high conviction long-term ideas. Let’s take a gander at the latest hedge fund action regarding Reliance Steel & Aluminum Co. (NYSE:RS). How are hedge funds trading Reliance Steel & Aluminum Co. (NYSE:RS)? At the end of the third quarter, a total of 27 of the hedge funds tracked by Insider Monkey were bullish on this stock, a change of 13% from the second quarter of 2018. 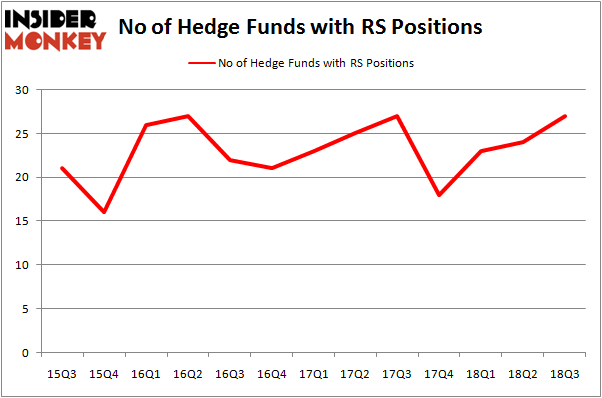 On the other hand, there were a total of 18 hedge funds with a bullish position in RS at the beginning of this year. So, let’s review which hedge funds were among the top holders of the stock and which hedge funds were making big moves. Among these funds, Luminus Management held the most valuable stake in Reliance Steel & Aluminum Co. (NYSE:RS), which was worth $97.8 million at the end of the third quarter. On the second spot was Royce & Associates which amassed $84.4 million worth of shares. Moreover, AQR Capital Management, Millennium Management, and D E Shaw were also bullish on Reliance Steel & Aluminum Co. (NYSE:RS), allocating a large percentage of their portfolios to this stock. Now, key money managers were breaking ground themselves. Bailard Inc, managed by Thomas Bailard, created the largest position in Reliance Steel & Aluminum Co. (NYSE:RS). Bailard Inc had $3 million invested in the company at the end of the quarter. Peter Algert and Kevin Coldiron’s Algert Coldiron Investors also initiated a $1.3 million position during the quarter. The other funds with new positions in the stock are Brandon Haley’s Holocene Advisors, Matthew Hulsizer’s PEAK6 Capital Management, and Bruce Kovner’s Caxton Associates LP. Let’s go over hedge fund activity in other stocks – not necessarily in the same industry as Reliance Steel & Aluminum Co. (NYSE:RS) but similarly valued. These stocks are Etsy Inc (NASDAQ:ETSY), Grupo Aeroportuario del Sureste, S. A. B. de C. V. (NYSE:ASR), Knight-Swift Transportation Holdings Inc. (NYSE:KNX), and Pure Storage, Inc. (NYSE:PSTG). All of these stocks’ market caps are similar to RS’s market cap. As you can see these stocks had an average of 24 hedge funds with bullish positions and the average amount invested in these stocks was $505 million. That figure was $374 million in RS’s case. Etsy Inc (NASDAQ:ETSY) is the most popular stock in this table. On the other hand Grupo Aeroportuario del Sureste, S. A. B. de C. V. (NYSE:ASR) is the least popular one with only 3 bullish hedge fund positions. Reliance Steel & Aluminum Co. (NYSE:RS) is not the most popular stock in this group but hedge fund interest is still above average. This is a slightly positive signal but we’d rather spend our time researching stocks that hedge funds are piling on. In this regard ETSY might be a better candidate to consider a long position. 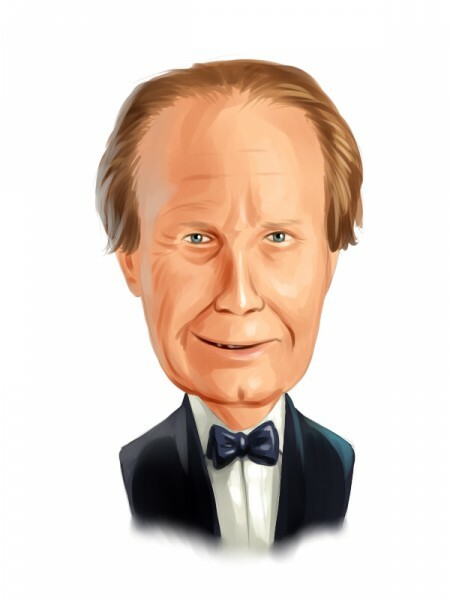 Hedge Funds Continue to Pile Into This Stock, Which Has Gained 667% in 2018 Hedge Fund Ownership of FMC Corp (FMC) Has Flatlined Hedge Funds Took Their Stunning Profits and Ditched Axon Enterprise, Inc. (... Hedge Funds Soured on This Chinese Internet Giant in Q3 Hedge Funds Aren’t Buying the Hype Around AeroVironment, Inc. (AVAV)&#... Apollo Global Management LLC (APO): Could It Hit $52 Per Share by 2020?